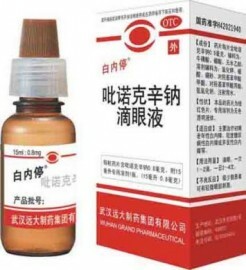 Pirenoxine Sodium Eye Drops, with the brand name BAI NEI TING, was studied and manufactured in 1974 solely by Wuhan Grand Pharmaceutical Group Co., Ltd and was put in production in 1976. It's sold all over the country of China (except Taiwan province). In 1984, it was awarded the national silver prize. It is the preferable medicament to treat the cataract in domestic market, and achieved high quality prizes many times. In 2001, it achieved free-checking qualification by its high quality. Its sales amount reaches three hundred million vials by far and benefit hundreds & thousands people since it come into the market. It is so popular and trusted by patients and praised highly by clinic experts. At present it is used widely in all main hospitals, for example: the Beijing TongRen hospital, 301 hospital and affiliated hospitals of many pharmaceutical universities. There isn't adverse effect in clinic usage for the past 30 years. We have been receiving good feedback from customer with thanksgiving letters and telegrams every week.